Order a ½ oz 1988 Chinese panda gold coin and possibly qualify for free delivery. It’s a collector’s dream to own genuine .999 Panda gold, which traces its lineage to 1983 and is guaranteed by the People’s Republic of China. Each year the reverse design of the coin is changed which has led to high demand by collectors. 1988’s reverse design features a panda holding bamboo along with markings showing purity and mintage. The obverse side depicts the Hall of Prayer for Abundant Harvests in the Temple of Heaven in Beijing. "People's Republic of China" in Chinese characters encircles the scene and is closed off by the year of issue, 1988. Order your own genuine panda gold coin today and add to your collection. 1/2oz 1988 Chinese Panda Gold Coin Order a ½ oz 1988 Chinese panda gold coin and possibly qualify for free delivery. It’s a collector’s dream to own genuine .999 Panda gold, which traces its lineage to 1983 and is guaranteed by the People’s Republic of China. Each year the reverse design of the coin is changed which has led to high demand by collectors. 1988’s reverse design features a panda holding bamboo along with markings showing purity and mintage. The obverse side depicts the Hall of Prayer for Abundant Harvests in the Temple of Heaven in Beijing. "People's Republic of China" in Chinese characters encircles the scene and is closed off by the year of issue, 1988. 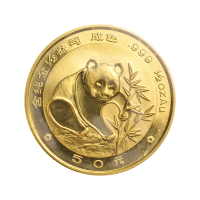 Order your own genuine panda gold coin today and add to your collection.